“Section 8 Welcome” is not a sign one might expect to see in the desirable Southdowns neighborhood, with its streets lined with stately oak trees and well-manicured lawns. 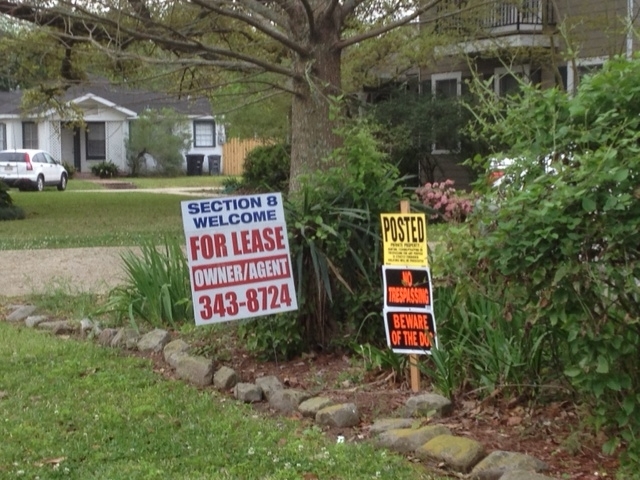 But last week, property manager Steve Myers, who owns about 50 properties in the 70808 ZIP code, put out targeted ads in front of some of his Southdowns rental properties advertising to low-income residents. Section 8 refers to a federal housing voucher program, offering rent payment assistance for private housing based on income levels and family composition. The signs didn’t last long. The three he put out last week were stolen or torn apart within 24 hours, Myers said. He said he filed a police report and has put up new signs. Myers, who had an unsuccessful run for mayor in 2012, is frequently at odds with his neighbors over his rental properties. He has previously been sued by the city-parish for violating an ordinance that has been used to prevent three unrelated persons from living together in residential neighborhoods. But he countersued the city-parish last year, asserting that the ordinance is unconstitutional and violates rights to privacy, association and equal protection. The definition of the family prevents alternative family structures, including foster parents and gay couples with children, from living together, Myers’ attorneys argued in court. In practice, the ordinance most frequently prevents young professionals or college students from being able to rent homes in residential neighborhoods. Myers often notes that the ordinance would prevent three nuns or “The Golden Girls” from renting a home together. A District Court judge agreed with Myers last year and struck the language. Since then, Myers has been free to rent to whomever he wants. Last week, the Louisiana Supreme Court heard arguments in the case, and it will issue a ruling on the District Court’s decision in the coming weeks. Myers said that regardless of how the Supreme Court rules, he’s entitled to lease homes to people receiving subsidized housing vouchers, which is something he already does in other parts of the parish. “I have a right to rent to Section 8 or group homes or large families, all of which will be more people and more dense than three young professionals or three nuns,” he said. Myers also said if the Supreme Court rules against him and he can’t rent to young professionals, then Section 8 recruitment may help him keep his properties occupied. “I’d love to rent to Bill Gates, but that’s not always who rents houses,” he said. Paul Naquin, a member of the Southside Civic Association, has been a longtime critic of Myers and has assisted the city-parish in filing lawsuits against the landlord by compiling evidence that he was renting to unrelated people. Naquin softened his comments since an interview last week on radio station WRFK’s “Jim Engster Show,” in which he stated he and other Southdowns residents do not want poor people in their neighborhood because they are more likely to commit crime. “We’d like to have everybody in the neighborhood like everybody else. You know, we don’t want a bunch of people in there of real poor means in there,” he said on the radio show. Naquin told The Advocate on Monday that Myers does not have respect for the neighborhood, and renting to Section 8-eligible renters would devalue Myers’ own properties. “Anybody in any subdivision in Baton Rouge, in any real nice subdivision, likes to keep their subdivision nice and clean,” Naquin said. Naquin also stressed he did not steal or vandalize Myers’ signs. “I have more sense than to get on private property to do that,” he said. Neighborhoods and cities generally cannot discriminate against Section 8 vouchers because of protections under the U.S. Fair Housing Act, according to Odinet, who is also a board member for the East Baton Rouge Parish Housing Authority. There are about 3,800 approved Section 8 housing vouchers in East Baton Rouge Parish, said Richard Murray, executive director of the parish Housing Authority, which administers Section 8 vouchers. There’s a waiting list of 10,000 people in the parish. Murray said vouchers are used in neighborhoods across the parish. However, he said, they are rarely found in expensive neighborhoods because vouchers only cover a fraction of the rent, and high rents are still cost-prohibitive for some of the renters. Myers insisted he was not trying to antagonize his neighbors with the signs, but added that he can’t help but “see the sport of the absurdity” of his neighbor’s opposition.